Book Review Pierdom By Simon Roberts Reviewed by Karen Jenkins Born of the Victorian invention of a holiday by the sea, the British pleasure pier has been for a century and a half both conveyance and destination, fixed landmark and mutable emblem. They sprang up from the exuberance of their day, through cast iron and steam trains – a promenade's stretch with bandstands and fun fairs. Their story follows the popular whim, as well as the effects of time and the elements. Simon Roberts has systematically photographed those fifty-eight pleasure piers that still stand today, after their heyday has waned, interested in what part they play in contemporary English leisure. Pierdom. By Simon Roberts. Dewi Lewis, 2013. Dewi Lewis, 2013. Hardbound. 160 pp., 81 color illustrations, 9-1/2x12". Born of the Victorian invention of a holiday by the sea, the British pleasure pier has been for a century and a half both conveyance and destination, fixed landmark and mutable emblem. They sprang up from the exuberance of their day, through cast iron and steam trains – a promenade's stretch with bandstands and fun fairs. Their story follows the popular whim, as well as the effects of time and the elements. Simon Roberts has systematically photographed those fifty-eight pleasure piers that still stand today, after their heyday has waned, interested in what part they play in contemporary English leisure. There is no intimate mix with the populace here; as in his We English project, Roberts takes a broad, collective view to get at this aspect of his nationalistic identity. He pulls back (and often up) to create his signature expansive landscapes, classical enough in their formal tropes to render his human players almost anachronistic. 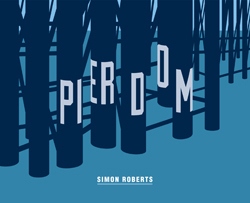 Pierdom, by Simon Roberts. Published by Dewi Lewis, 2013. Like a coastal home in a storm's certain path, in a practice sense, the pleasure piers have no business being there. Unlike the American shore-hugging boardwalks, these elevated platforms reach straight out from solid land, in varying lengths and relative boldness. Roberts' photographs show how they've fared the everyday exposure and assault of storms, fires and fear of wartime invasion. His series creates a certain ubiquity of planks and pilings that reminds me of the construction scaffolding in large cities – so ever-present as to be almost unseen, these markers of vulnerability and change, of structures repaired or reconsidered. This collection also taps into the reasons why the piers were built in spite of all this – the ephemeral pleasures of experience and view that evoke their Victorian beginnings. In Roberts' imagery, the remains of the Brighton West Pier look like a burnt out Crystal Palace, another time's fleeting fair and lasting symbol. His seascape of the place where the lost Margate Jetty once stood channels Gustave Le Gray and pulls out all the picturesque stops; the pier may be gone, but that sea and sky remain to be seen by all who have the time to stop and look.